In order to create thai boba tea, all you need to do is follow a regular thai iced tea recipe (included below), with one extra step! It's all about knowing WHEN to add the boba. Let's get started! Starting with our organic thai iced tea blend, measure out two teaspoons of loose tea and place it directly in an infuser or teabag. Boil some water (the fresher the better! ), and pour a half cup of the water over the infuser or teabag. Let this steep for three to five minutes. Add one teaspoon of sugar to the hot thai tea, or however much you please. If you want to drink the tea right away, pour it over ice. If you want to save it for later, add another half-cup of room-temperature water to dilute the tea, and then refrigerate. We recommend letting it sit at room temperature for about 10 minutes before you refrigerate, or else the thai tea might turn cloudy from chilling too fast! 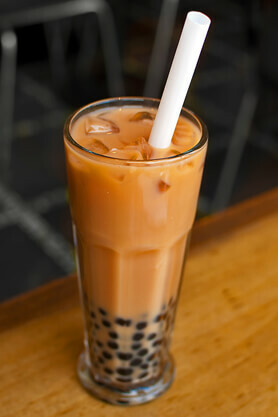 Now that your tea is iced or chilled, it's time to pour the thai tea over the boba tapioca pearls. You can order these at many online stores, or you can find them in specialty grocery stores in your area. Note that for many of them, you'll have to cook the boba pearls according to the included directions. But it is important that you don't add them to the thai boba tea until it is chilled! Add two tablespoons of your favorite dairy product (condensed milk, whole milk, or half'n'half), and stir! Or if you want that layered look, slowly pour the dairy over the ice cubes from a spoon, and do not stir. And of course, feel free to adjust the amount of dairy used to suit your tastes.